Installed for over two decades on homes, offices, National Parks, Navy housing, fire stations, campgrounds, ski resorts cabins, in every State of the US and abroad. Available with different options for mild areas or hard freeze mountain areas. Options include standard Plug-in or solar electric powered. All systems include one or several rugged high performance Gobi collectors, available in three sizes and to be installed on a sun exposed roof or ground. Easy mounting hardware makes adapting easy for tilted or flat surfaces. The Gobi collector absorbs solar radiation which heats water in its inner passages. 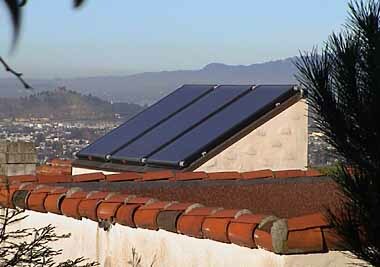 This heat must then be transported to storage, either a solar storage tank or water heater. Some mechanical equipment and control is therefore needed to achieve this automatically. These are called "open-loop" or direct systems because they circulate the water directly from the water heater to the Gobi collector. Designed for mild areas, some options include light freeze protection, such as a freeze dribble valve at the collector outlet, or automatic water cycling through the collector when it is cold. They can be 115V plug-in or solar electric powered. These are "indirect" or "closed loop" systems that carry a non-freezing fluid in the collectors. A heat transfer appliance safely transfers the heat from the Gobi collectors to the water. These systems achieve very high year-round output while protecting the collectors from freezing and hard water deposits for long life. Their highly efficient heat exchanger designs combine with the high capacity of the Gobi for best all-around systems in all areas.